TIFF announced today that Matthew Heineman’s A Private War will make its world premiere at the 43rd Toronto International Film Festival Ⓡ on Friday, September 14, at Roy Thomson Hall — joining the Festival’s Gala Presentations lineup. The film marks the feature narrative debut of critically acclaimed director Matthew Heineman ( Cartel Land, City of Ghosts) whose previous work in documentary filmmaking has earned him an Academy Award nomination, two Primetime Emmy Awards, and two DGA wins for Outstanding Directorial Achievement in Documentary Award. 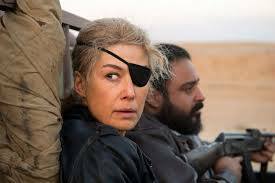 A Private War, a biopic based on the true story of award-winning war correspondent Marie Colvin, stars Rosamund Pike ( Gone Girl, Hostiles) in one of her most intense roles to date. Based on a blistering 2012 Vanity Fair article by Marie Brenner, the drama follows Colvin to the front lines of conflicts around the globe as she risks everything to reveal the truth. Pike is joined by supporting cast which includes Jamie Dornan ( The Fall, Fifty Shades of Grey ), Stanley Tucci ( The Lovely Bones, Spotlight), and Tom Hollander ( The Night Manager). “It has been a deeply personal journey sharing the extraordinary story of Marie Colvin in A Private War,” stated filmmaker Matthew Heineman. “We are so thrilled to be able to finish the film in time to premiere at TIFF and honored to share with the audiences there"
At a time when journalism itself is under attack, Marie Colvin is one of the world’s most celebrated war correspondents. She is an utterly fearless and rebellious spirit, driven to the front lines of conflicts around the globe to give voice to the voiceless, while constantly testing the limit between bravery and bravado. After being wounded by a grenade in Sri Lanka, she wears a distinctive eye patch and is still as comfortable sipping martinis with London’s elite as she is confronting dictators. Colvin sacrifices loving relationships, and over time her personal life starts to unravel as the trauma she has witnessed takes its toll. Yet her mission to show the true cost of war leads her to embark — along with renowned war photographer Paul Conroy (Dornan) — on the most dangerous assignment of her life, in the besieged Syrian city of Homs. A Private War is directed by Matthew Heineman and written by Arash Amel. The film is an Aviron Pictures presentation in association with Tri G and The Fyzz Facility, and a Kamala Films, Thunder Road Films, Savvy Media Holdings, and Denver & Delilah Films production. Producers include Basil Iwanyk, Marissa McMahon, Matthew George, Heineman, and Charlize Theron. Executive producers are Erica Lee, Jonathan Fuhrman, Ashley Schlaifer, Jeffrey Sobrato, Joe Gelchion, Beth Kono, A.J. Dix, David Dinerstein, Jason Resnick, William Sadleir, Wayne Marc Godfrey, and Robert Jones. Bloom is handling international sales. A Private War opens in US theatres on November 2. For film synopses, cast lists, images, and more information, see tiff.net/galas. Festival tickets are now on sale. Buy tickets online at tiff.net, by phone at 416.599.TIFF or 1.888.599.8433, or in person at a box office. See box office locations and hours at tiff.net/tickets. The Toronto International Film Festival is generously supported by Lead Sponsor Bell, Major Sponsors RBC, L’Oréal Paris and Visa, and Major Supporters the Government of Ontario, Telefilm Canada, and the City of Toronto. This film is eligible for the Grolsch People’s Choice Award. Vote for your favourite films at tiff.net/vote. The Gala programme is made possible through the generous sponsorship of Fairmont Hotel & Resorts.